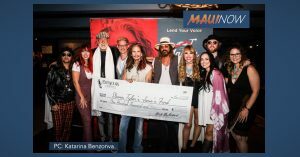 A benefit concert on Maui featuring Gretchen Rhodes, Mick Fleetwood and Steven Tyler & Loving Mary raised an estimated $100,000 for Steven Tyler’s Janie’s Fund. Janie’s Fund is a philanthropic initiative created by Steven Tyler in partnership with Youth Villages to bring hope and healing to girls who have suffered the trauma of abuse and neglect. All funds raised during the concert at Fleetwoods on Front Street went toward the fund. VIP Guests enjoyed a meet and greet with Mick Fleetwood and Steven Tyler together, reminiscing and taking questions from the crowd. “They discussed their long history together, a strong friendship filled with exotic locations, motorcycles, croquet and interesting conversation,” organizers said. Richard Shaw, Chief Development Officer of Youth Villages, spoke of the foundation before the show, saying he was incredibly grateful for Mick Fleetwood’s support. 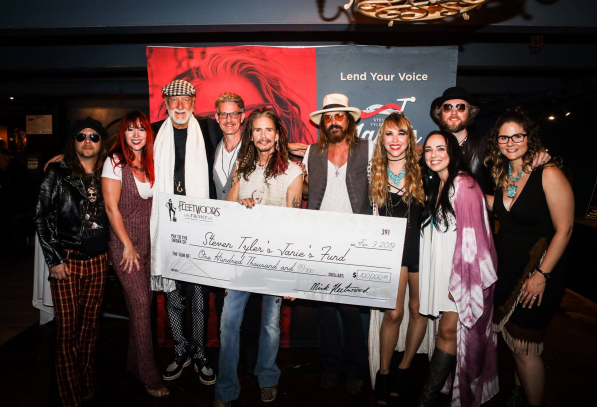 The night ended with the presentation of a giant check signed by Mick Fleetwood and accepted by Steven Tyler. “It’s money that is sure to make a difference,” organizers said.